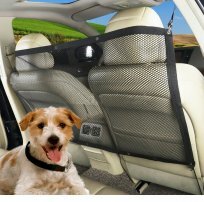 Car Pet, Kid Barrier / Vehicle Backseat Mesh / Universal Elastic Safety Seat Net / Disturb Stopper [CAR005982] : Onchee.com - the accessory shop for all your handheld Electronics! The backseat mesh can create a more Comfortable and Safer Haven for the driver, passengers and pets alike. It can keep your pet at bay and while enjoying the drive with them. It can use as a pet barrier keeps dogs from constantly going from the cargo area to the driver's and passenger's seat. It can greatly eliminates distraction and allows you to focus on the road. It also unlikes the metal barriers, it is easy to install and remove with hooks and adjustable strips. Can be attached either to the handles above the door or the front seat headrests. It fits virtually in any car, van or SUV. The pet barrier is quick and easy to assemble with not tools necessary at all and can be easily moved from vehicle to vehicle. - A high quality mesh net and comes with the bungee cords. - It is a see-through barrier that allows 4-pawed passengers to see the driver from the back seat, reducing ride stress, and vice verse. - Long and high than normal, multiple holes for adjusting the configuration, fits most cars, vans, trunks or SUV. - No need to worry about dog jumping to your seat and putting you at risk of a wreck or anything while driving. - Easy to store or set up in car, little bungies that will hold net in place, no damage to the car interior. - Cars, Vans, Trunks or SUV. - Virtually fits in any car. - Fits to small and meduim sized pets, not suitable for big pets. - Check your car carefully, you need to have 4 places to hook the 4 bungee cords in place. - If your pet is over-active, please use a pet seat safety belt instead. - Net Weight: 125g approx.